Layla and Rafiq are traditional Muslim Indians. After their arranged marriage in Hyderabad, young Layla joins Rafiq in northern California, where they immerse themselves in their mosque and its community and start their family. MIRZA, Fatima Farheen. 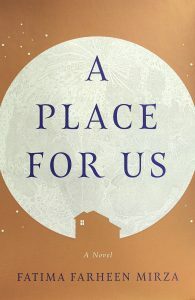 A Place for Us. 448p. SJP for Hogarth. Jun. 2018. Tr $27. ISBN 9781524763558.